Tomorrow’s March report on consumer inflation is expected to support Evan’s outlook. 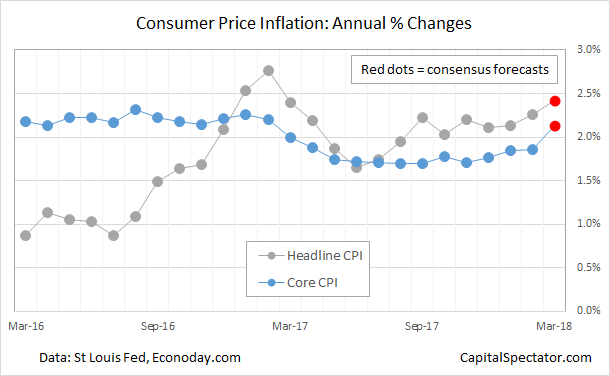 Keep your eye on the core reading (excluding food and energy) of the consumer price index (CPI), which is expected to rise above annual 2.0% mark for the first time in 13 months, based on Econoday.com’s consensus forecast. Headline CPI is already running above 2% and is projected to tick up to 2.4% for the year-over-year change through March – the highest since Feb. 2017. Inflation is still tame by historical comparisons, but Wednesday’s update looks set to reaffirm the view that a modest upside bias is in play for the pricing trend. 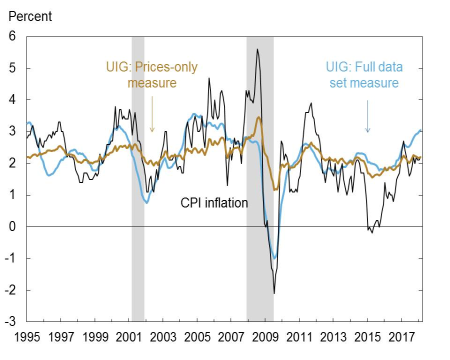 That’s also the message in the New York Fed’s Underlying Inflation Gauge (UIG), which has been posting mildly firmer readings in recent months. The central bank is expected to leave interest rates unchanged at next month’s policy meeting, according to Fed funds future, but another round of tightening is anticipated in June. Futures in early trading this morning (Apr. 10) are pricing in an 84% probability of a 25-basis-point rate hike to a 1.75%-to-2.0% range in two months, based on CME data. 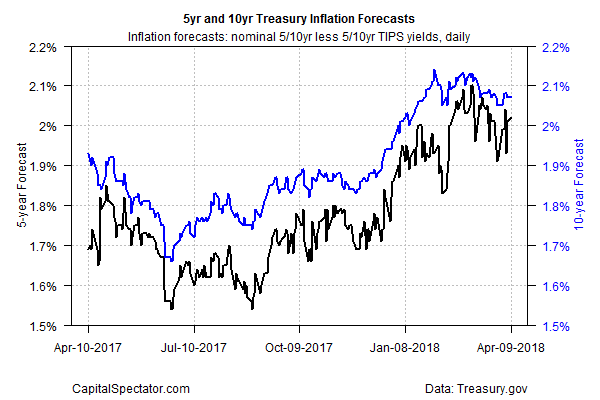 Inflation may be strengthening, but the outlook at the moment calls for only a modest increase above the Fed’s 2% target, based on the implied forecast via the yield spread on nominal less inflation-indexed Treasuries. The market’s estimate for both the 5- and 10-year maturities is currently slightly above 2%, as of Monday (Apr. 9). In both cases, the firmer forecasts have been holding steady in recent months, suggesting that the crowd expects that the uptick in pricing pressure isn’t about to ramp up significantly any time soon beyond what we’ve seen in recent months. The public’s outlook on inflation is running a bit hotter than the CPI these days, according to the New York Fed’s survey of consumer expectations. But expectations on this front are also contained. “Median inflation expectations at both the one-year and three-year horizons remained unchanged in March at 2.8% and 2.9%, respectively,” the bank reported yesterday. Short of a hefty upside surprise in tomorrow’s CPI data, the numbers published to date suggest that inflation’s pace is firming but is in no danger of running significantly hotter in the near term.